Riu Cancun, an all-inclusive beach getaway in Cancun's Hotel Zone, is filled with fun and activity for the whole family. Guests are met with a beautiful stretch of white-sand beach facing the blue waters of Cancun. Three spectacular pool areas, a supervised children's club and an incredible array of delectable dining choices are sure give every guest the fun and relaxing vacation they are looking for. 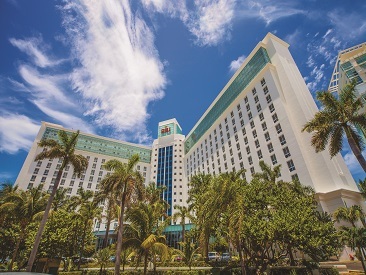 The impressive 15-story Riu Cancun is just steps from Cancun's famous nightlife center and promises a casual, all-inclusive beach getaway jam-packed with fun and activity for the whole family. A beautiful stretch of beach beckons guests with calm waters and included water sports. Three spectacular and distinctive pool areas provide ample opportunity for quiet relaxation or active poolside fun. Children ages 4-12 will have a blast at the supervised children's club, and everyone will find an incredible array of mouthwatering dining choices day and night. 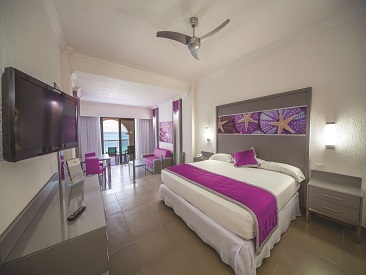 Additional resort activities and entertainment options include a popular sports bar, a disco and a theater with famous RIU theme shows and privileges at sister hotel, Riu Caribe. Furnished with thatched-roof palapas and graced by calm waters, the resort's beach extends 219 yards along Cancun Island's north side, where it is protected from open-sea swells. The resort's entire waterfront contains garden-fringed sunbathing terraces with padded lounge chairs and umbrellas. The Riu Cancun hosts an excellent entertainment program both during the day and in the evening. You will find pool and beach activities for both adults and children. In the evenings, the Riu Cancun has a different stage show each night with live music and a lively disco. Riu Cancun provides preferential conditions and additional value to their guests when contacting, booking and paying directly at Riviera Cancun golf course. Kids ages 4-7 and 8-12 enjoy age-specific entertainment promoting fun learning through outdoor physical activities including group games and sports, cultural games and swimming pool recreation. Free Wi-Fi is available in designated public areas of the resort. Wi-Fi is available in rooms for a charge.